Journalist Nilanjan Mukhopadhyay has been covering Modi’s career for a long time. ‘When he was seventeen, Narendra Damodardas Modi had an extra middle name—‘Trouble’’ Mukhopadyay wrote in an Outlook newsmagazine piece. Trouble continues to be Modi’s middle name as far his political opponents are concerned because in the face of seemingly overwhelming odds he manages to pull through and show state progress. Modi had the insight to welcome the Tata Nano plant to Gujarat after Tata pulled out roots from West Bengal. He currently flaunts a state policy of progress and is busy building Gujarat the brand through an ad campaign starring Amitabh Bachchan. Modi also takes immaculate care of his own brand image, even lending his name to a short sleeved kurta designed by Jade Blue of Ahmedabad. Mukhopadhyay covers all the elements of Modi’s life, from his success as a child actor which was to stand his political career in good stead, to his walking out on his family at the age of 17 for life in the RSS. From then there was no looking back, even though the road was a rough one. He associated himself with the saffron party and proved to be a good organiser for the Ekta Yatra. Mukhopadhyay’s book is an attempt to understand the many sides of Modi. And certainly there is much about the man and politician that is mysterious. Few books have in fact delved into Modi’s younger years and Mukhopadhyay covers aspects like the fact that Modi’s teacher at the BN High School remembers him as an extremely argumentative child, talks about his days as helper at his father’s tea stall and his distribution of badges for local political leaders. On an even more personal front, Narendra Modi abandoned his child bride at 17 and refused to have anything further to do with her. Modi is known for his abstemiousness and is also known to be ruthless towards his political rivals. It is also certain that he will never be able to live down the Godhra riots, even while he has been making overtures to the minority community in Gujarat. His charisma too has Mukhopadhyay comparing him with Jyoti Basu, though he points out that unless Modi makes a dent in the Delhi hierarchy, he will remain a regional chieftain. Obviously Mukhopadhyay had managed to hit several nails on the head during his research work because by the end of the book he had become a persona non grata in the Modi camp with phone calls going unreturned and doors remaining shut. As a coverage of events leading up to Modi’s career set against the Indian political canvas, and as a sketch of a larger than life leader, Mukhopadhyay’s work is thorough and definitive. 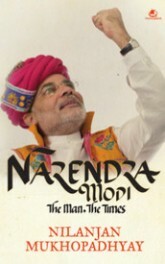 One Comment on "Narendra Modi: The Man, The Times"